A couple of A-Rod cards from his time with the Mariners - a Fleer Tradition variation and a Stadium Club insert. A couple of delightfully goofy Collectors Choice inserts. My first True Value card! Always fun to get a card from an oddball set I'd never seen before. Yesterday I swapped a few Paul O'Neill cards and picked a Brewers pack because it also looked like it might have variety. It was still mostly 2014 Topps. But there was other stuff like Chrome and Bowman from 2012 and 2013. Catcher Andy Skeels played in the Padres and Yankees organizations from 1987 to 1993. In 527 games he hit .252 with 13 HR and 238 RBI. A native of New Zealand, he managed that country's team in the 2013 World Baseball Classic, and has been a hitting coach in the Giants organization for several years. You can read more about Skeels at The Greatest 21 Days. Hickory Farms is an Ohio-based operator of mall kiosks that sell meat and cheese gift boxes and baskets. Established in 1951, they have over 550 locations across North America. 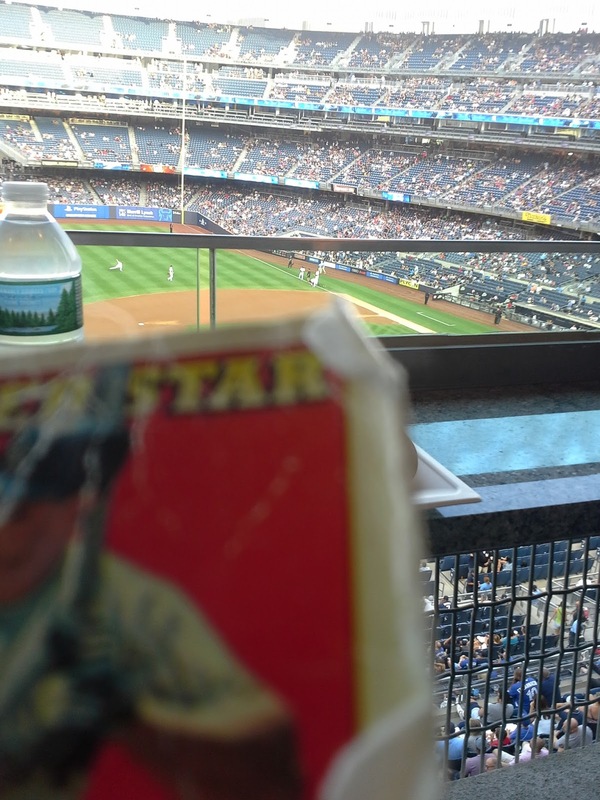 Wallet Card showed up at Yankee Stadium, but the Yankees bats didn't. For the first time in six trips to the Stadium Wallet Card saw a Yankee loss, a 5-0 disappointment. CC Sabathia pitched pretty well but the bullpen let him down. While the Yankees offense was so bad that even Gary Sanchez didn't homer (he did hit a double and a single). Oh well, even with a loss it's fun to go out to the ballpark. I gave Al some more Nettleses, including a '78, and got a Cardinals pack. I picked it because the Cardinals are my second favorite team and also because I could see it had more variety than the other packs. Got a few hundred cards in a great trade with Bru of Remember the Astrodome. There were lots of great random cards, like this nice autograph shot. A lot of 2016 Topps Heritage. A lot of 2016 Topps Archives. I can see why everyone is enjoying the 1979 design. Lots of 2015 Topps Heritage. He pared down my want lists on a lot of mid-90s sets, bringing several down to 20 needs or less. There was also a lot of 1989 Star - one of my favorite minor league sets and one I don't have a lot of cards from. I sent Night Owl one card to finish his 1982 Topps set a couple of weeks ago, and he kindly responded with about 20 cards from 2012 Topps. I'll have to update my wantlist but I think it brings me down to needing about 10 more to complete the set. Interestingly the best-looking cards in this package were all horizontal. Maybe it's just the baggy uniform but Dice-K's wrists look really tiny in this photo. Jay Estrada pitched in the Indians organization from 1987 to 1991. In 143 games, all in A ball, all relief, he put up excellent numbers 18-16, 24 saves, 3.10 ERA. I would guess he must have been injured at some point, probably 1990, which is why he didn't advance. The always-informative Greatest 21 Days has a profile on him but there's not much there, either. Like Jay Estrada, Catherines seems to be a mystery as well. There is a plus-size women's clothing chain called Catherines that has a location in a different part of Spokane, as well as a different NorthTown Mall, in Minnesota. Don't know if this Catherines is related to those or something completely different. Seems to be women's clothing of some kind, though. This was the cool discovery I mentioned in a post a couple of weeks ago. This sign is in the Herald Square station. Both MTA and PATH trains share this station, with a corridor in between the two lines. The corridor runs under a retail space that is currently the Manhattan Mall but was originally built in 1967 as an EJ Korvettes. EJ Korvettes was a department store chain on Long Island and in NYC. There is a very famous urban legend that the name refers to the founders being "eight Jewish Korea veterans". In fact it was started two years before the Korean war by two Jewish WWII veterans with the initials E and J who had served on Corvette warships. The chain was defunct in 1980. Recently JC Penney moved into most of the Manhattan Mall and they are doing construction on the lower level, which is visible in the corridor between the subway and PATH trains. 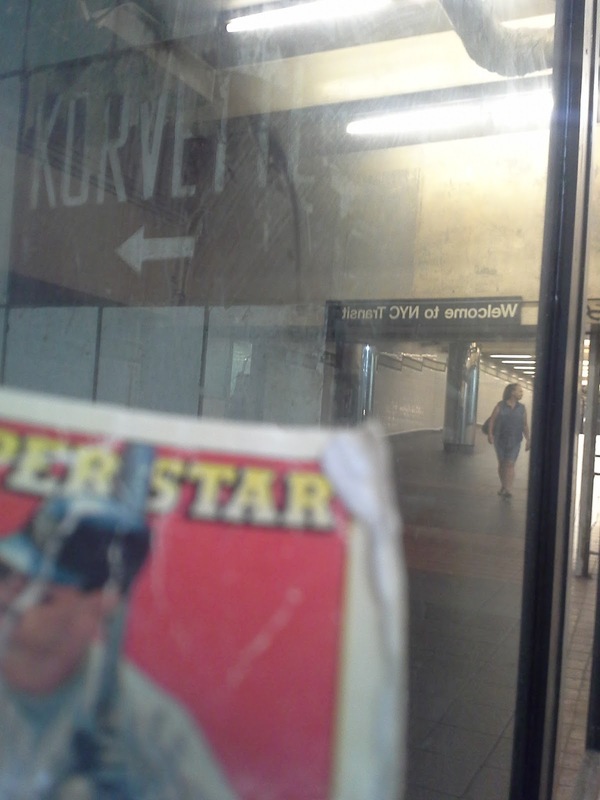 It looks like at one point you could enter Korvettes directly from the station. 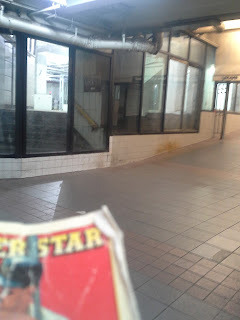 At some point, presumably the store's closing in 1980, that entrance was sealed up but the renovations reveal both the sign and the stairway leading from the subway into what was the store. This was not listed on any of the several NYC blogs that usually post this material. I gave Esther Crain of Ephemeral New York a heads-up about the sign and she put a nice write-up on Korvettes on her blog. Longer view where you can see the stairway and where it was bricked over. 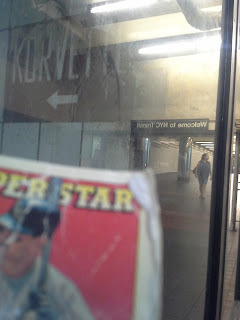 Close-up view of the Korvettes sign (there is a reflection of the corridor in the glass window). Rich Holsman pitched in the Padres organization from 1987 to 1991. In 190 games he went 35-35 with 25 saves and a 3.20 ERA. He is now Sales Manager at Bay Equity Home Loans in McCall, ID. As you might expect there is not much online about a late-1980s mall food court business. Jennet Siniff owned Jennet's Kitchen from 1985 to 1991. Traded Al a couple more cards - a pair of oddball Mattinglys. In return I picked up a Reds pack - mixture of Bowman and Topps from 2014 again. I'm pretty sure I'd seen this card of Mike Leake batting on other blogs. Nice photo with the Kahn's logo in the background. There were two of this card in the pack. Anyone have any needs from 2014 Topps? 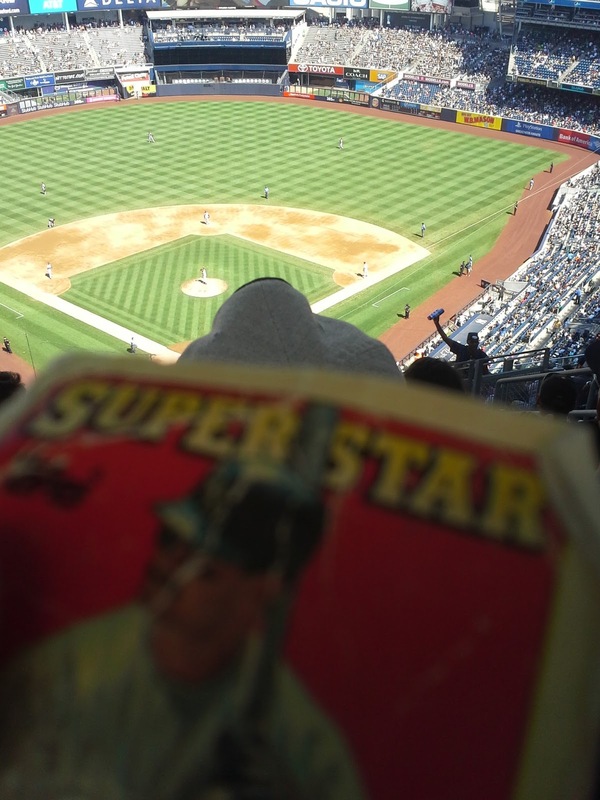 Al the street vendor needed some cards of Hideki Matsui and Tino Martinez cards. In return I picked up a small bag of 2014 Dodgers cards - Bowman, Topps and Topps Update. I also got this really nice Bowman refractor card of former Yankees prospect Anthony Claggett. Infielder Steve Tolleson played in 182 games for the A's, Orioles and Blue Jays from 2010 to 2015, hitting .245 with 6 HR and 29 RBI. This year he is in the Royals' organization, but has appeared in just eleven minor league games due to injury. The son of former Yankee Wayne Tolleson, he is also a partner at Parallel Financial in Greenville, SC. He kindly answered my questions about baseball cards. "I enjoyed collecting baseball cards when I was growing up. To this day I still have complete sets that my dad bought for me. I enjoyed organizing them by team. I have not collect cards since I was a little boy. Now as a player, I have enjoyed collecting memorabilia in the form of bats, balls and jerseys from players that I have played with or against. My favorite baseball card of myself is an action card of me turning a double play and jumping over a former teammate and friend, Nick Punto." I picked up five packs from Baby Starks yesterday for five bucks. They were still pretty good but noticeably less newer cards this time around. All in all there were about 110 cards, of which I needed just over half. I think I'm going to restrain myself to one or two a week from him, unless I see something really great. Still some 2014/2015 Bowmans in these but not nearly the volume there had been. There were two copies of this great beard card so one is up for trade. I did not yet have this great hair card, though I had seen it on a bunch of blogs. One nice thing about these packs is that the star cards are not pulled out, so I am able to get some cards that would otherwise be hard to acquire at these prices. Best card in this set was this shiny, numbered card of Matt DeSalvo, who was a Yankee prospect ten years ago. 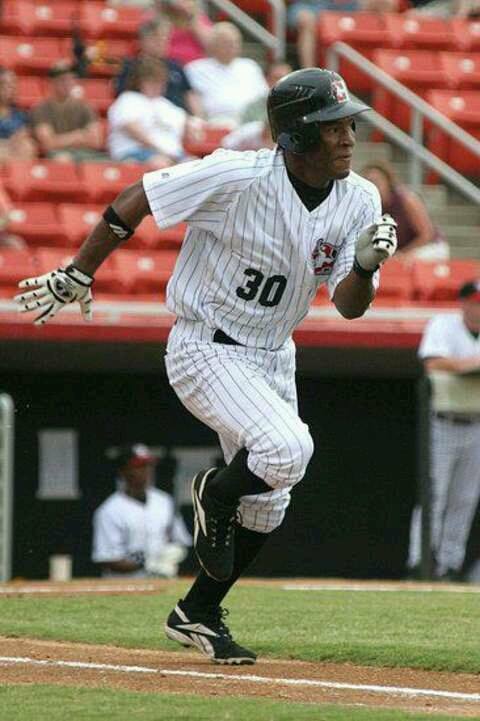 Outfielder Wanell Macia Severino played eight seasons of professional baseball, mostly in the Pirates organization. In 351 games he hit .271 with 5 HR, 123 RBI and 30 SB. He is now living in the Dominican Republic and looking for a job. He is having some financial difficulties; if you can assist him, you can reach out to him on Facebook. Usually when I go to Yankee Stadium I sit in the cheap seats, but last night I got to go to a game in a corporate suite, thanks to a vendor that does work for my company. It's a nice setup with a room with couches, a kitchen and bathroom, basically a hotel room without a bed, and covered seats outside the room. 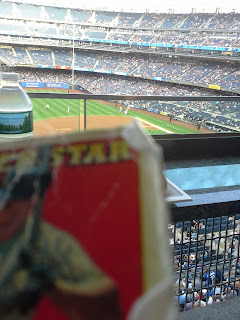 Even better the seats, though outdoors, were air-conditioned which was nice in the heat wave we are having here in New York. The game itself was quite exciting. The Yankees left 14 men on base and only scored one run but managed to win because rookie Chad Green was brilliant (six shutout innings, 11 Ks) as were Tyler Clippard and Adam Warren. Dellin Betances looked awful but great plays by Mark Teixeira and especially Chase Headley (turned a line drive by Edwin Encarnaion that looked sure to tie the game into a game-ending double play) bailed him out. Aaron Judge continues to be amazing - no home runs but he drove in the game's only run with a double. I don't have any cards of him or Green - anyone have some to trade? Judge is probably the next Kevin Maas/Shane Spencer/Shelley Duncan but he sure is fun to watch right now. I managed to snap a quick wallet-card photo from my seat before the game. The Yankees are now 5-0 in two seasons that wallet card has been there. Saul Soltero put up some excellent numbers in his five seasons in the Padres organization, going 18-10 with 33 saves and a 2.58 ERA. Unfortunately injuries including Tommy John surgery ended his career prematurely. He is now a youth baseball coach in Nebraska. He is with some mannequins at what I am pretty sure is JC Penney. Hard to read in the scan but looking at the actual card I believe it says JC Penney on the bag. There is still a JC Penney at the store - last month a suspected shoplifter pepper-sprayed an employee there. 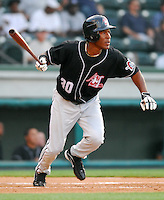 Infielder Ronald Ramirez played five seasons of professional baseball, mostly in the Astros organization. In 318 games he hit .243 with 9 HR and 91 RBI. He kindly answered my questions about baseball cards. "Just have been collecting about four baseball cards because I don't know to find the rest of the cards." Thanks! Any good suggestions for finding his cards? I had another request from Al - he wanted some Tom Seavers and some Pete Roses. I had a few '84 Topps Seavers (his last year with the Mets) and some 87-89 Topps manager cards of Rose - good enough to take five more cards out of his box. The one on the left is Hank Greenberg in military uniform. The other two in this picture are Barry Bonds inserts. I really like that one on the bottom. Jorge Mateo is the Yankees prospect who got suspended by the team earlier this year after conflicts with team management. This is a purple chrome cards numbered to 250. I almost never purposely acquire vintage, but the chance to open the legendary Billy Martin card where he subtly flips the bird to the photographer was too good to pass up. This was my favorite card in the trade. I was surprised it was Bowman, their cards are usually pretty boring looking. This one is really spectacular. This is more like what you expect a Bowman card to look like. I have most of the no-names in this set - cool to get a Brett Gardner rookie. Hopefully I'll feel similar about this Gary Sanchez rookie. He's off to a good first week or so with the Yankees. This shiny Randy Johnson card appears to be a night card. Two Yankee Stadium employees are very prominent in the background. Another cool shiny card with lots of floating heads. Vintage designs are fun, but even better when they are gold and shiny. Finally one more shiny card - almost looks like fireworks going off behind him.